In the United States, there is only one living coral reef, but it is a big one. It runs along the coastline of Florida all the way to the top of South America. 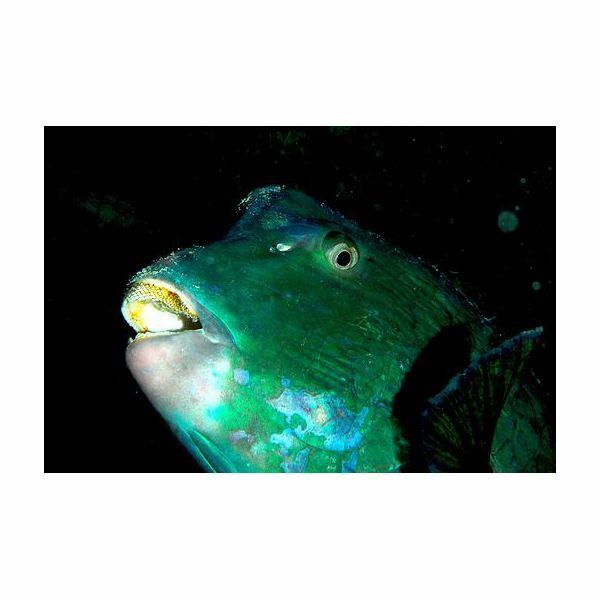 The salty water has thousands of inhabitants, including the most interesting, the humphead parrotfish. Around the world, humpheads are found mainly in the Indian and Pacific Oceans, from the Red Sea east to the Line Islands, north to Taiwan, and south to the Great Barrier Reef and New Caledonia. There are many kinds and types of parrotfish, named partly because of their myriad colorful scales, which resemble parrots and their colorful feathers. Humpheads (Bolbometopon muricatum) are not as colorful as some other parrotfish but they may be olive, blue-green or slate-grey, with a yellowish to pink head. They are similar to birds in another manner as well. They have beaks with strong teeth in a vertically shaped head. The humphead parrotfish is as big as a dog. The largest species of parrotfish, they can weigh up to 46 kilograms (about 100 pounds) and reach a length of 1.3 meters (nearly 4 1/2 feet). They grow slowly and their life span is about 40 years. The reason for its name is the prominent bulbous forehead, which develops in adults. They use these big foreheads in head-butting contests for a chance to mate or control the school. It is their most distinctive feature. Often a social and gregarious animal coming out of shoals (a lower bank area), parrotfish swim mostly in schools and can group together up to 75 or more. They use their pectoral fins to motor around. Most extraordinary though are their mouths, which house beak-like front teeth—big ones. They also have pharyngeal teeth at the back of their throat. All this is an adaptation for their lunch. They prefer eating algae off the coral. To get this, they take big bites of coral, which is extremely hard material. The parrotfish grind the coral into a hard paste, extracting what they love most, the algae. The hard material that does not provide nutritious food for them is pulverized and passed like feces. Yes, they poop sand. Because of this phenomenon, after eating approximately five to six tons of coral a year, they produce enough sediment to create new reefs, distribute more sand, and influence the structure of current reefs and spawn new coral reef ecosystems. They also help to keep algae in check. Humphead parrotfish are dependable when it comes to spawning (called an aggregation). Often after a full moon rotation, in the early morning, females release eggs that are fertilized by the sperm circulated in the water by the male humpheads. In addition, humphead parrotfish have an interesting way to sleep. They create a mucus-like bubble around themselves. Unfortunately, they are routine in their mating and other habits, and since humphead parrotfish like to school in large numbers and use predictable sleeping sites in shallow waters, it makes them easy to harvest for food. Many people consider the fish a delicacy. Despite the fact they are the wariest of parrotfishes, overfishing has apparently altered the behavior of humphead parrotfish. Being vulnerable to spearfishing and the rest makes them extinct in some regions like Guam, the Marshall Islands, Fiji and East Africa. Reefs may seem small in respect to the large oceans. However, they and the developing coral are as important to the seas as rain forests are to the land. Earle, Sylvia A. Coral Reefs. Washington, D.C.: 2003. Book. Arnosky, Jim. Parrotfish and Sunken Ships: Exploring a tropical reef. New York: HarperCollins Publishers, 2007. Book. Sullivan, Jody. Parrotfish. Mankato, Minnesota: Capstone Press, 2006. Book.